"Mommy! It's not fair!" declared Jack one night after a stint in the time-out chair. "You always say I have to love my brother, but he hit me first! I don't love him very much when he hits me." "Well, Sweetie," I replied hastily as I stirred dinner on the stove, "in this house we love one another, no matter what." "I know, I know," he said begrudgingly, "God wants us to love each other." He paused for a moment, looked thoughtful and then asked, "But we don't have to love bad guys, right?" "Well," I answered, turning away from the stove and taking a deep breath. (Why is it they always want to ask the deep theological questions when you have 3 burners going and a baby underfoot?) "actually God does want us to love bad guys. He says if someone is mean to you, you should be kind to them." "WHAT?" he gasped, eyes wide as saucers, "WHY??" Clearly this concept was too much for his little black and white brain to handle. Doesn't the superhero always fight the bad guy? "What do you think would happen if someone were kind to a bad guy?" He thought for a minute. I saw the little wheels turning in his brain. "Maybe he would turn nice," he answered, "Maybe bad guys are mean because they don't have any friends. Maybe if we be kind to them, they won't be mean anymore." It's so easy to tell your children to love one another, to turn the other cheek. 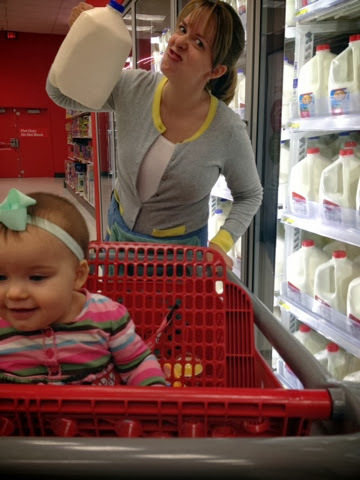 Last week, in the middle of Target, I had a chance to show them how to demonstrate that love. I can't really tell you what happened leading up to the altercation. I was on the hunt for frozen waffles, which would normally be a simple task, but when your navigating a ginormous cart full of grabby children through the store, grocery shopping becomes more like a jungle scavenger hunt with a team of wild monkeys. The school bus of shopping carts. All I know is one second I was prying a bag of shredded cheese from the clutches of my toddler, and the next instant, out of nowhere, a well-dressed, middle-aged woman, wielding a gallon of milk, angrily SHOVED my cart, with my children in tow, a good foot back towards me yelling, "DO YOU MIND??" Now. I am worthless in confrontational situations. (Luckily this is about as intense as it gets in southern suburbia. I would never survive somewhere like prison. Or New Jersey.) I always think of the perfect thing I should have said after the fact, but the only thing that came out of my mouth was, "ARE YOU KIDDING ME??" "NO, I AM NOT KIDDING!" she ranted, waving her milk in the air to punctuate her point. "You are IN MY SPACE!!" I mean, who does she think she is shoving carts of tiny children and sending their mother stumbling backwards?? I wanted to really TELL. HER. OFF. But again, the nastiest thing I could muster was, "Are you insane? What is your PROBLEM?" "Oh, I'll TELL YOU WHAT MY PROBLEM IS. You people with kids just think you OWN THIS STORE!!" She spewed a few profanities as she huffed away, and I did what I always do when people yell at me. I cried. "You are MEAN and RUDE!" I shouted between sniffs, even though by this point she was already in the next aisle. 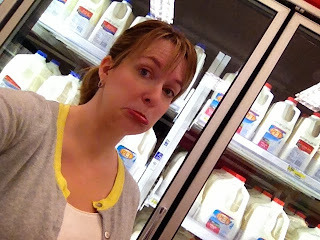 Of course, all the other shoppers had stopped their shopping to watch the drama in the dairy aisle. One kind woman patted me on the back, "You have lovely children, don't let her upset you." Well, it's a LITTLE LATE FOR THAT! Like I said, I don't do confrontation very well, so I spent the next 10 minutes wandering aimlessly, completely forgetting everything else on my shopping list. I tried to make sense of what had just happened and what I should do next. What a lunatic!! I know! I'll go find her and purposely follow her around the entire store! We will all sing "Frosty the Snowman" the whole time! That will make her REALLY mad! Then, when she totally loses it, I'll record it on my phone and I will put her CRAZY FACE ALL OVER THE INTERNET! Yeah, that'll teach her! Then I heard it. I heard my own voice in my head echoing what I always tell my children. Love one another, no matter what. Her outburst seems so petty looking back. She came at me with milk, not a knife. She didn't threaten my life, but she hurt my feelings. And I wanted to hurt her back. I remembered Jack saying, "Maybe bad guys are mean because they don't have any friends. Maybe if we be kind to them, they won't be mean anymore." And I began to think of this sharp-tongued stranger in a different way. Rational people don't pick fights with mothers and their small children. We encroached on her personal space, but perhaps a much bigger problem was filling her mind. Maybe she had recently been let go from her job. Maybe she had to put the family dog to sleep this very morning. Maybe she is addicted to milk and, dang it, she needed her fix!! Sure there are times to stand up for yourself and there are times to fight back. But what if we fought back with love instead of hate? Instead, when push comes to shove (literally in this case), how often do we bare our teeth instead of turning the other cheek? How much do we dig in our heels instead of going the extra mile? If I'm really teaching my children to love one another, to love thy neighbor, doesn't that include the mean and cranky neighbor? Or the neighbor that cuts me off in traffic? Or the neighbor that curses me out for no apparent reason? It should be noted that on a return trip to Target, Jack came prepared with a plastic sword stuffed down the back of his shirt. Clearly, my shopping trip had been ruined for the day, so I made my way to the check out. Of course, there she was, loading her groceries on the conveyor belt. I took a deep breath and wheeled up behind her. Here was my chance to show love and give grace. "Hey. I'm sorry about all that back there in the dairy aisle." I wish I could tell you that my kind words made her burst into tears, hug my neck and exclaim, "I'm so sorry too! You see, I'm just so on edge cause I have this awful milk addiction! But, you know, thanks to you I think I just may be able to give it up." That would have been a spectacular ending to this story. Maybe I was secretly hoping she would have some sort of similar reaction. Instead, I got NOTHIN. She would not look at me, would not speak to me. She completely ignored my presence. I'm not sure what I could have done differently to fight back with love. Maybe I could have offered her a hug back by the milk and cheese. Maybe I could have insisted on paying for her groceries. I do know that my ignored attempt at reconciliation made me feel better. And, even though my children were too busy begging for treats in the check-out line to notice anything else going on, I suppose I need to start practicing what I preach for when they are watching. I guess the point is, I'm going to have to be careful what I'm teaching my children, because I might just have to start living it out. My pulse still quickens every time I pass a refrigerated milk case. I know, I'm positive that was the reason for her crankiness!! I love your blog. :) I'm sorry that lady was such a jerk but I think you did a good job handling it. I'd probably gone after her wielding a block of cheese. Yes, cheese beats milk any day!! Aw, this was such a sweet post, even if you did get assaulted! ;) I just signed up to follow you! Can't wait to read more adventures! I am 150% there with you in the always teaching to lead with love and kindness, and then needing to remember that they listen to my actions more than my words, and wishing I was better In The Moment. Also with the terrible with confrontation. I think it was really admirable of you to go apologize. Good job, mama. Thanks for sharing! 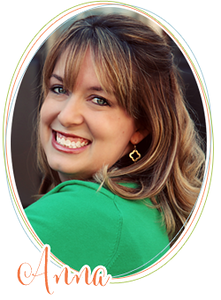 I found you through Momastery and I love you! Thank you for sharing your messy beautiful! I am terrible with confrontation because I go the other direction. I would have been more like, "Did YOU just shove MY buggy full of CHILDREEEEEEN?!?" aaaand, perhaps security would have been called, after everyone watched us yell back and forth for a few minutes. Rarely, I get a trip to the grocery without the kids (once every three or four months, if I'm lucky). 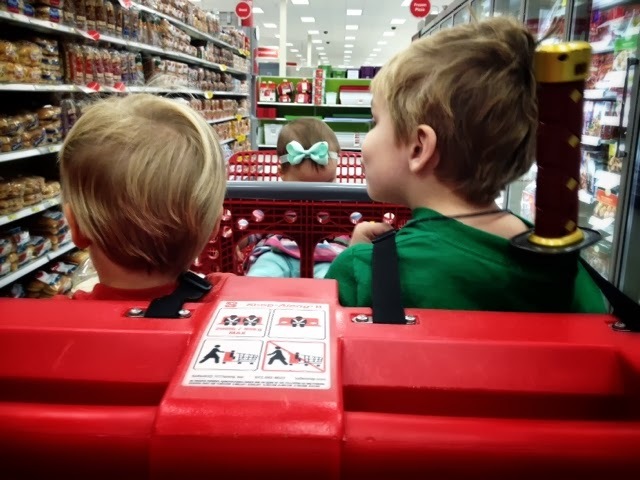 I've seen what it's like, recently, to have to navigate the aisles around families. And you know what? It's a little annoying, especially when you didn't bring your kids. 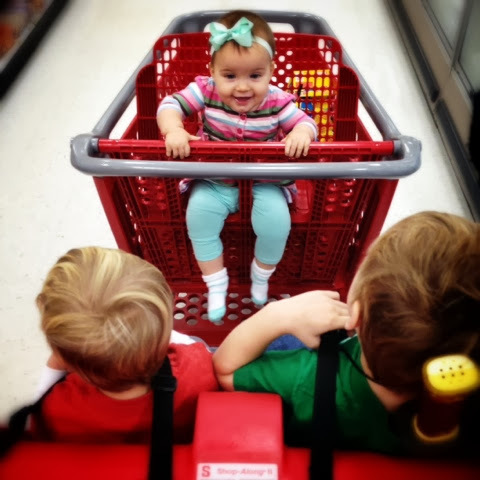 However, I like to smile at the moms w/ carts full of kids, and wave to the kids. Sometimes, that knowing smile is helpful in lessening Mom's stress, which calms the way she responds to the kids, which calms the way the kids respond to her... and everyone has a better day. Hopefully, one of those mean folks will read your post, and decide not to be so mean in the future. Will pray for ya', 'cause it sounds as if you have a life similar to mine... :) And we could all use a little prayer. Amen! May all the Targets be filled with people like you! Thanks for stopping by, Victoria! Faith-driven wife & mommy. Recovering perfectionist. After having 3 children in 3.5 years, I'm learning to let go and let life happen. © 2014 This Perfect Mess. Powered by Blogger.